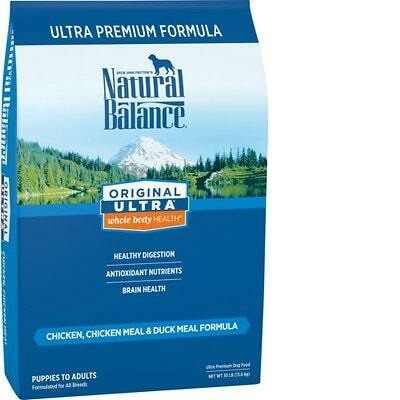 Natural Balance Original Ultra Whole Body Health is a low-priced dog food with great quality. This product has no controversial ingredients, including zero artificial preservatives, colors and flavors - that’s fantastic. However, It has a high amount of carbs, compared to its protein and fat content, but uses excellent quality meat and fat. Natural Balance has an above-average number of recalls but the company was relatively transparent when answering our questions. Watchdog Labs recommends this product. The average dog food we reviewed has 39 total ingredients, with 1 controversial ingredient. This product has 0 controversial ingredients, absolutely excellent! As mentioned above, Natural Balance Original Ultra Whole Body Health doesn’t have any controversial ingredients, that’s really great. Natural Balance Original Ultra Whole Body Health is made in the USA, excellent. The meats and added oils in this food are clearly named, identifying which animals they came from. That’s excellent and something to always look for when buying dog food. Chicken, Chicken Meal, Chicken Fat, Duck Meal, and Menhaden Oil are the ingredients we’re talking about here. This product contains 0 controversial preservatives, that’s outstanding and a great sign of quality. It’s good to know that ‍not all artificial preservatives are bad. That’s because they serve an important purpose, which is to prevent food from spoiling. However, we consider 11 artificial preservatives controversial because of their potential link to cancer and other serious health conditions. Natural Balance Original Ultra Whole Body also doesn’t have any artificial colors, great. No artificial flavors either, that’s great news. 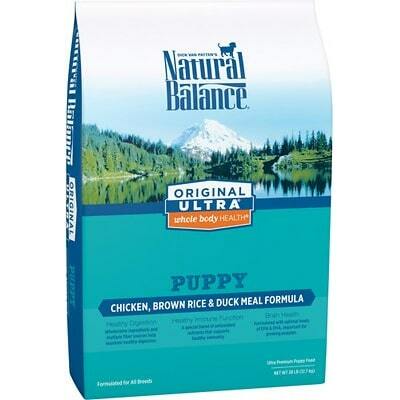 This dog food manages to ace all three “artificial ingredients” tests, an excellent performance. We love it. Natural Balance has an above-average number of recalls. The recall was initiated because Natural Balance Pet Foods has confirmed that certain dry pet food formulas manufactured by Diamond Pet Foods may be contaminated with Salmonella. 5 lb. and 28 lb. 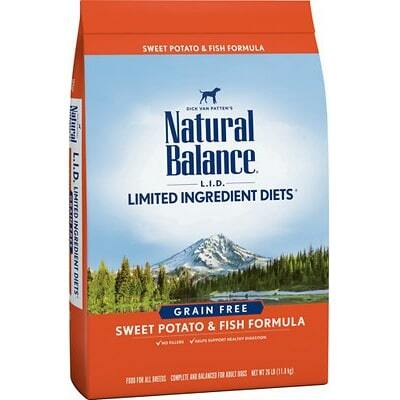 bags of Natural Balance Sweet Potato & Chicken Dry Dog Formula with “Best By” June 17, 2011. 15 oz. cans of the following varieties of Natural Balance Eatables for Dogs: Irish Stew With Beef, Potatoes & Carrots, Chinese Take Out With Sauce With Vegetables and Chicken, HOBO Chili With Chicken & Pasta, Southern Style Dumplings With Chicken & Vegetables. Potential for ofbotulinum (bacteria that causes botulism). 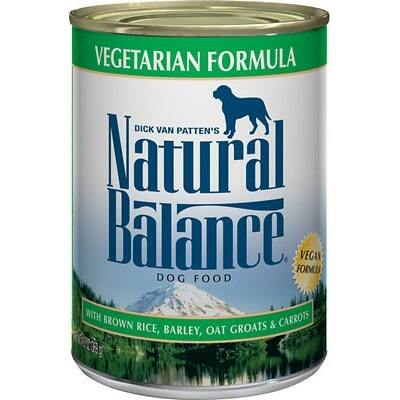 The following Natural Balance foods: Beef, Chicken and Lamb Formula Dog Food, 13 oz. cans, Venison and Brown Rice canned and bagged dog foods, Venison and Brown Rice dog treats, Ocean Fish Formula Cat Food 3 oz. and 6 oz. cans, Venison and Green Pea dry cat food. Natural Balance did not responded to our email within the first day suggesting that we should call in with these questions. We then placed a call and received answers to the questions below. Since the call was not recorded, the following responses are paraphrased - they should not be seen as exact statements from the company. Yes, we have a nutritionist is on staff. But can’t share names. ‍Many companies choose to not share the names of the specific professionals who work on their products. We would highly prefer to know the people behind the products. Do not. Feel they are invasive. Instead routinely test nutrient content values. We found a number of companies felt like the AAFCO feeding trials were either invasive, or inhumane. Majority in USA, with a few exception being manufactured in a Thailand facility with LID Mini Rewards in Canada. It’s unclear how safety can’t be disclosed for competitive reasons.